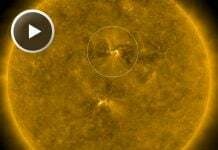 Parallel to the Draconid meteor shower, a M-class solar flare — the strongest flare that’s been seen since mid-August — erupted from the sun’s surface. 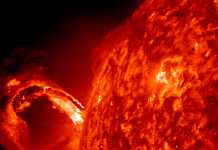 This incredible CME was recorded by the Solar Dynamics Observatory satellites between 00h00-02h30 UTC on October 09, 2013. 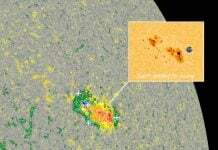 The eruption was classified in the M2.8 Class Flare and detected at 01h48 UTC on AR11865 including the so-called ‘oscillation phenomenon’, which is clearly visible in the second and third loops of the video, as the arches of solar plasma wave back and forth in the wake of the explosion. 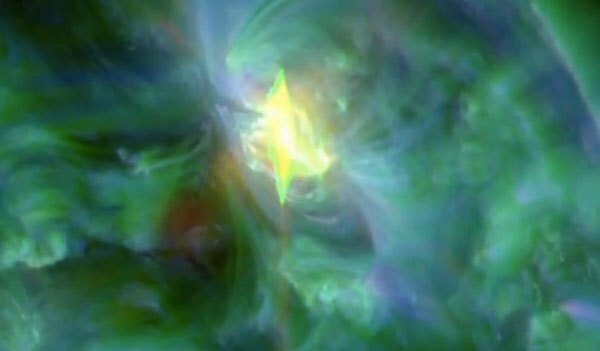 The last strong flare was observed on August 17, 2013. It will help producing more amazing auroras such as these northern lights recorded in Malletts Bay, Vermont on 10/8/2013.